Adrenal Tincture is a unique herbal blend helps tonify the adrenal glands and promote resilience to stress. Astragalus membranaceus is considered to be a Qi (chi) tonic and used extensively in Traditional Chinese Medicine and Ayurvedic medicine. Astragalus is a true adaptogen, neither too stimulating nor too relaxing, but rather helping the body to find its optimal balance. Astragalus seems to be effective for many body systems including the immune system, adrenal glands, the liver, and the cardiovascular system. It increases mitochondrial function and enhances tolerance to stress. Eleutherococcus senticosus is another adrenal adaptogen that has a wide variety of applications in the body. Also known as Siberian ginseng, this herb is native to the Taiga region of the Far East and its use dates back 2000 years. Eleuthero may improve attention, mood, and stress tolerance. It is useful for people who are debilitated from cancer, chemotherapy, cardiovascular disease, or other chronic health conditions. Eleuthero is stimulating and warming. Panax ginseng- This adrenal adaptogen is also called Chinese ginseng or Asian ginseng, and has been in use since at least the 1st century C.E. Its many constituents, such as ginsenosides and panaxans, contribute to its many effects such as supporting immune function, lowering blood sugar, improving libido and erectile dysfunction, increasing sperm count, and enhancing physical and intellectual performance. Glycyrrhiza glabra is commonly known as licorice. Glycyrrhiza helps the body recover from long term stress by increasing the half life of cortisol. Licorice also possesses anti-inflammatory action by blocking certain leukotrienes. Glycyrrhiza is often used as a demulcent to heal the digestive tract and as an anti-viral and antioxidant. Kelp offers a concentrated source of minerals such as iodine, magnesium, potassium, calcium, and iron. Kelp is traditionally used to support endocrine function, particularly the thyroid gland. Juniper communis is an evergreen tree that has historically been used to treat gout, cancer, warts, urinary tract conditions, and more. It has carminative and anti-inflammatory actions and is therefore useful for the GI tract and rheumatic conditions. Saw palmetto, also called Serenoa repens, is native to the Caribbean Islands and the Southeastern USA. Serenoa contains flavonoids, fatty acids, and sterols which inhibit DHT (a type of testosterone) from binding to receptors. Therefore serenoa has been used effectively to treat people with prostate disease and PCOS or other conditions with elevated testosterone levels. Traditional use also suggests saw palmetto can help increase appetite and energy levels. Prickly ash bark was used medicinally in some Native American tribes to treat sore throats, upset stomach, infections of the skin, and aching muscles. Later herbalists used prickly ash bark to stimulate digestion and nervous system function, to treat rheumatic conditions, and as an alterative to help the body fight infections and recover from disease. 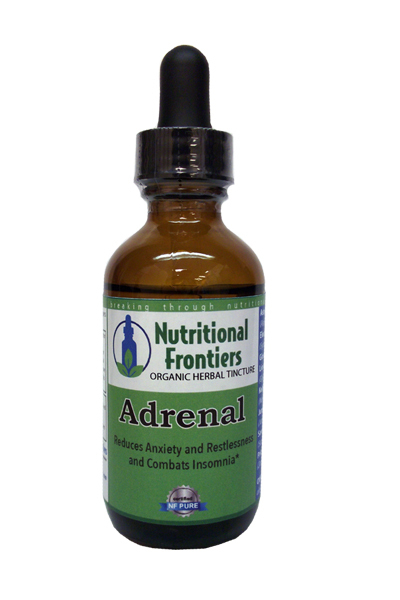 Adrenal Tincture is a unique herbal blend helps tonify the adrenal glands and promote resilience to stress. Healthy adrenal function is a key component of overall health and well-being. Suggested Use: 1-2 droppers, 3-6 times daily, add to water or juice. Warning: If you are pregnant or nursing, or have active ulcerative colitis, peptic ulcer disease, or gastroesophageal reflux, consult your health care practitioner before taking this or any herbal product.